Leica Rugby 820 horizontal laser offers general contractors the best-performing system for any levelling and simple slope application on site. Whether it is concrete levelling, single or dual slope, the Rugby 820 rotating laser delivers ultimate accuracy all day long. Teamed up with the Leica Rod Eye 140 Classic, the Rugby 820 offers an ideal solution for quick setting of forms and footings. With the Leica Rod Eye 160 laser receiver, receive a digital readout for easier checking of forms. Ensuring the ultimate performance of Rugby 820 laser level and the highest application efficiency and reliability, the Leica Rod Eye 180 RF receiver enables smart functions, such as Smart Targeting, Smart Lock and Auto-Calibration. With the Rugby 820 horizontal laser and any of the Leica Rod Eye receivers, applications can be done effectively by one person and without setup changes, saving time, materials and money. 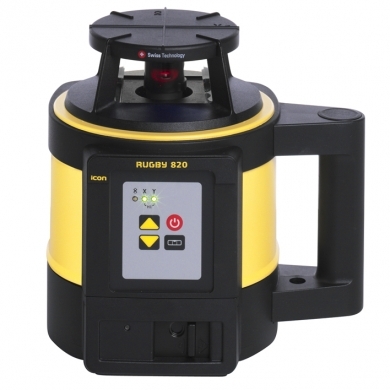 Auto-Calibration, provides contractors with the possibility to check and calibrate Rugby 820 laser automatically.